Today is the long-awaited release date for the Blu-ray and DVD of The Chronicles of Narnia: Voyage of the Dawn Treader, and Twentieth Century Fox Home Entertainment has now placed Dawn Treader ships in 3,000 supermarkets nationwide, including Kroger, Safeway and SuperValu. 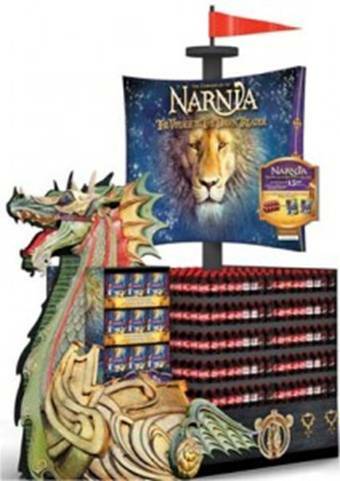 These displays occupy approximately 3 feet by 8 feet of floor space, are quite remarkable replicas of the Dawn Treader ship! Have you seen one in a store near you yet?!? 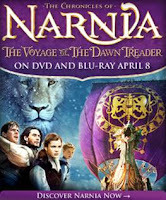 I am excited this has finally came to DVD so I can get my husband to watch it with me! Its focused on Edmund and Lucy in this one more and its great. They have an annoying cousin who tags along and through the movie you will learn to love the annoying one lol! We are going to check a our local Safeway this weekend to see if it is in a store near us. I am sure my son would want to say Hi and wave to him. He is really into waving to everything its so cute. It would make a really fun playhouse when the promotion was over too! I might have to look into that. Hi I'm your newest follower from the I love my Online Friends Blog hop and was hoping you could follow me back as well! :) Heres the link: www.shopaholicmommy.net Thanks so much!